For those with hand tremors, mealtimes can be moments of frustration rather than enjoyment. Can a high-tech spoon help? I have very clear memories from when I was a girl of my grandpa sitting at the table, hands fluttering wildly, struggling to get a spoonful from his plate to his mouth without making a mess. His Parkinson's disease made what should have been a relaxing, comforting meal with family into a stressful battle with his own body. 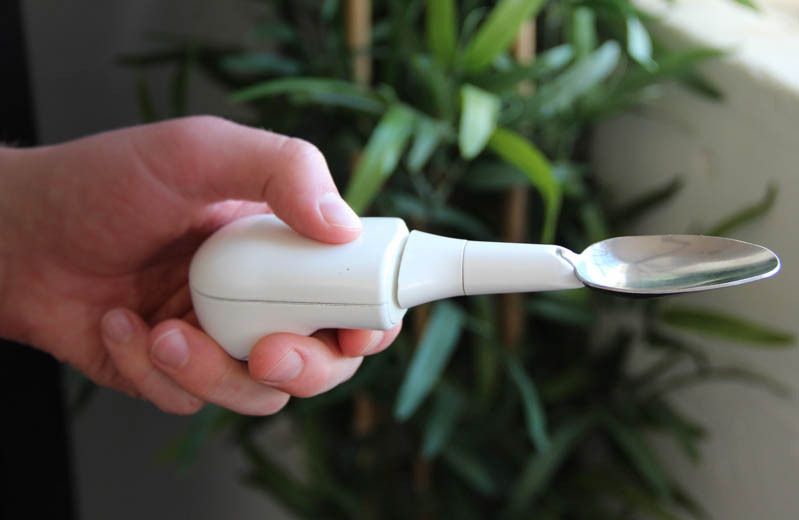 A new spoon from Lift Labs may help others who suffer from hand tremors that make eating difficult. The spoon (which down the road will also have knife and fork attachments) counteracts the movements of a wavering grip, reducing the shaking by 70 percent. Sara Hendren, an artist and researcher who runs Abler, a site devoted to adaptive technologies and prosthetics, likened the Lift Ware spoon to an "edit" of more familiar flatware. "This kind of 'edit' extends self-feeding for its user," she wrote to me over email, "and maintaining that kind of autonomy can be very significant to one's own self-perception and the perceptions of others. After all, the experience of change in a person's ability is registered as much in these qualitative ways as it is in hearing the results of lab tests." In a sense, all technologies are "assistive" technologies -- eating hot soup with one's bare hands does not sound particularly effective, nor pleasant. We have invented spoons to extend our limited abilities. The Lift Ware spoon extends that reasoning to be yet more inclusive. And that sort of thinking can be fruitful for designers and inventors. "Constraints are always generative for designers," Hendren said, "and this set of constraints—digging deeply into all kinds of atypicalities, less visible conditions, psycho-social challenges, and the many varied experiences of aging—is a still largely untapped area of design research and development. This example of the spoon might yield further consideration of cutlery altogether. Cultures already use different implements for eating. Why not re-examine cutlery entirely?"